It’s 3.15am and my alarm has already been buzzing next to my head for a few snoozes (please tell me I’m dreaming?). It’s still dark outside and it’s so quiet not even the birds are stirring. BUT the flower markets are calling and its time to start the weddings for the week! In the hour and a half drive to the markets I have a bit of time to first wake up and get my head around what we’ve got going on for the days to come. In high season, we have multiple weddings each week so I need to make sure we have accommodated accurately for each bride. The flower orders are in hand, and there are scribbles all over it with suggestions for extra flowers and substitutes should I need them! Once I finally get home (around 9am) the girls are already there and its time to get the creative juices flowinnnnn. First cab off the rank is filling up a mountain of buckets (and I mean a mountain!) with water, re-cutting each and every flower stem and putting the flowers in the cold room. I don’t know if you can imagine, but a whole van load of flowers equals a heck-of-a-lot of stems to condition! On a busy week our cold room gets quite full and we spend a fair bit of time reshuffling to make sure every flower is nice and cool (cause nobody likes to feel all hot and bothered!). Most weeks we end up spilling out into the studio and it very much feels like we are living and working in an overgrown, weirdly diverse jungle. Once all of the flowers are in water and safely cooling down, I get my team together and we have a little meeting to go over the tasks for the week and what we need to accomplish each day. 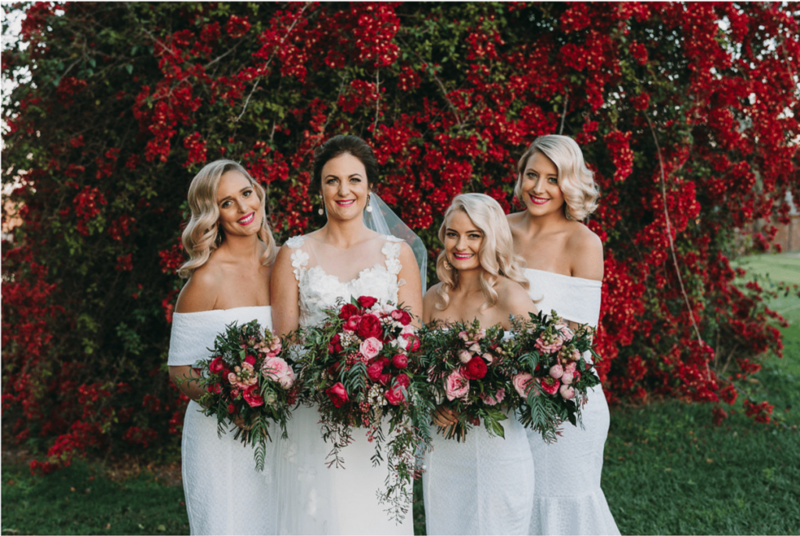 Like any business, being on the same page is crucial for a wedding florist as it means we are all in the know and working efficiently towards the same goal! Over the course of the next three days (Tuesday, Wednesday and Thursday) my team and I will work long and hard hours to get everything ready for the weekend. Every arrangement we do here at Willow Bud is carefully and artfully put together. Each flower for the bridal bouquets is scrutinized individually and only the best are set aside. Flowers for buttonholes, corsages, hair flowers and cake flowers are also selectively picked out and put aside to fulfill their floral destiny later in the week. By the time it hits 5 o’clock on each day we have been at it for at least 8 hours. We’ve picked up countless heavy buckets, stripped hundreds of flowers, our feet are a bit achy, our nails are dirty (and in dire need of a mani! ), we’ve got blisters, calluses, cuts and the occasional thorn wound, but we’ve had a productive day! Each wedding is well on it’s way and we are ready to continue the final preparations before the weekend. Now it’s off for a wine and a bath and a mental reprieve before the real craziness begins!